I read this article and found it very interesting, thought it might be something for you. 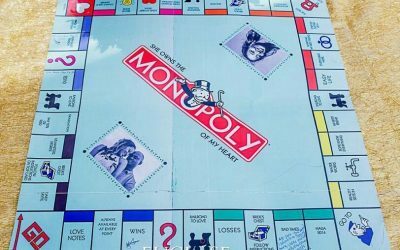 The article is called #IdeasYouCanTry: Monopoly and is located at http://www.ipcevents.com.ng/ideasyoucantry-monopoly/. So how about we use your Favorite Board Game as your wedding Guest book with your Love Story inputted as the Milestone??? Really!!! Yes! It’s possible……. WOW! that would be great, after-all She Owns the MONOPOLY of My Heart. If you look closely, you would see how they met, date, what happened in between, how he proposed, where he proposed, when they started dating etc. So categorically, just by looking at the board, you can summarize their Love Story at a glance.